Journey to Fort William from Camerons Cottage overlooking Loch Ness and take a ride on the famous steam train. 'The Jacobite' runs on the West Coast Railway from Fort William to Mallaig. This famous train operates from May to October. The service will run Mondays to Fridays throughout, and also on Saturdays & Sundays in the peak holiday season. This 84 mile round trip is described as one of the great railway journeys of the world and is notorious for its gradients and tight curves which force the steam engine to really work hard. The journey starts at Fort William situated at the southern end of the Great Glen and lies in the shadow of the highest mountain in Britain, Ben Nevis. Along the way the train visits Britain’s most westerly mainland railway station, Arisaig. It passes close by the deepest freshwater loch in Britain, Loch Morar, and the shortest river in Britain, River Morar before finally arriving next to the deepest seawater loch in Europe, Loch Nevis. What a journey. 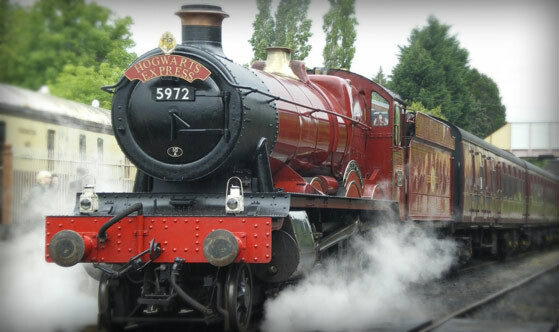 Follow in the footsteps of Harry Potter along the route used by the Hogwarts Express. West Coast Railways, operators of ‘The Jacobite’, provided the steam train and carriages for the ‘Hogwarts Express’ as seen in the Harry Potter films. Travel to Mallaig along the line used in the films. The train stops en route to Mallaig at the village of Glenfinnan beyond which are the villages of Lochailort, Arisaig, Morar and Mallaig. You may alight at Arisaig by request to the guard. From here, on a clear summer’s day, you can see the Small Isles of Rum, Eigg, Muck, Canna and the southern tip of Skye. The train continues on from here passing Morar and the silvery beaches used in the films ‘Highlander’ and ‘Local Hero’. Cross the unmistakeable landmark of the 21 arched Glenfinnan Viaduct, a must for Harry Potter fans of all ages. At the end of the line is the village of Mallaig, a busy fishing port and ferry terminal with services to Skye and the Small Isles. Arriving in Mallaig you have over an hour and a half to have a walk round and enjoy a lunchtime stop over before returning to Fort William. You will need to book this train trip as it is extremely popular. Visit the Jacobite Steam Train website to find out more and book online.